Having a dog means that I am outside every day walking her despite the weather. It’s supposed to be warmer weather now it’s May, but you can guarantee the British weather with throw a curve ball at any given moment and turn the weather cold, windy or wet. I don’t always want to be wearing my big Winter coat to walk the dog, and it’s not always practical to juggle an umbrella with a dog lead, so I was very pleased to try this Trespass ladies jacket. I chose Cassis Pink as my colour choice, but the jacket comes in four different colours, black, pink, blue and purple. For a jacket to be a good match for me when out walking it needs to have certain functions. It’s no good to me if there aren’t any pockets because where would I be storing my keys and phone etc. I don’t always want to be taking a handbag with me. The Trespass ladies jacket has two pockets deep enough for my hands to fit in without any gaps to the elements. Don’t you hate it when your hands are in your pockets and they’re still cold because the pockets aren’t deep enough? 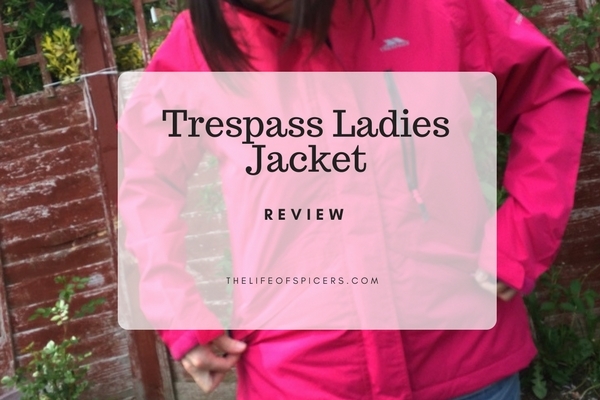 This Trespass ladies jacket ticks the boxes for pockets for my hands. There are also two other pockets on this Trespass ladies jacket, an inner one and a water repellent zip pocket to prevent items getting wet when it rains. This is a great idea for my phone as I always worry that in a downpour, my phone won’t be safe from the water. Another big issue for me with jackets are the length. I feel the cold a lot, so I don’t want a jacket that will ride up and expose flesh if it takes my jumper with it, or sits on the waist. As you can see the Numbered Trespass ladies jacket is a nice length on me, (I’m 5ft 3inches) and sits below the waist line. It also features draw cords to be able to adjust the jacket to fit around the waist. How does it fit in arms length and manoeuvrability? – Whilst I am quite short, I still struggle sometimes with sizing of jackets being broad enough in relation to length. Walking a dog (or when the dog walks me) means that my arms are constantly in front of me and I don’t like to feel the jacket I’m wearing straining against its seams. I am happy with the Trespass ladies jacket in the sense that it’s very roomy in its sizing. This jacket is a Medium and I am a size 12. So what happens when it rains? The Trespass Numbered ladies jacket has a hood that sits nicely on the back of the jacket when not in use. You can see it’s not an oversized hood with a good shape to its peak which stops the rain falling into my face. There is good structure to the hood without it being too rigid and thankfully it stays where it should. I have worn so many jackets in the past where they have just blown off again in the slightest wind, or they are too big and I can’t see where I’m going. The jacket is waterproof to 2000 mm and breathable to 3000 mm. Overall, the Trespass Numbered ladies jacket is a great investment for an all weather walking jacket. At the moment it’s on sale for £24.99 instead of £59.99 so if you’re looking for a new jacket, I can highly recommend this one. I was thinking of getting a child’s one for Miss A. Me too and this one is perfect. What a coincidence. It’s a great jacket isn’t it. Looks good, will be keeping it in mind when we go camping next! Looks great on you Ang ! I’ve had coats from Trespass for the kids before and they are such good quality.